Nepal Prime Minister KP Oli has decided to invite his Indian counterpart Narendra Modi for a religious festival in December - an occasion that is expected to provide another opportunity for the two countries to set a new direction in their close but complex relationship. The Bibaha Panchami' marks the wedding procession of Lord Rama from Ayodhya to Janakpur in Nepal on December 12. Mr Oli has been seen as determined to expand cooperation with China. His statement earlier this year that Nepal will "remain engaged in the vibrant economic drive of the neighborhood" and that it respects the "legitimate interests of our neighbors" is seen as a mark of his intention to cultivate ties with both China and India. For New Delhi, which has been pursuing PM Modi's "neighbourhood first" policy, countering China's plans to expand its footprint in the Himalayan country is crucial, especially in view of Pakistan's close ties with the Asian giant. 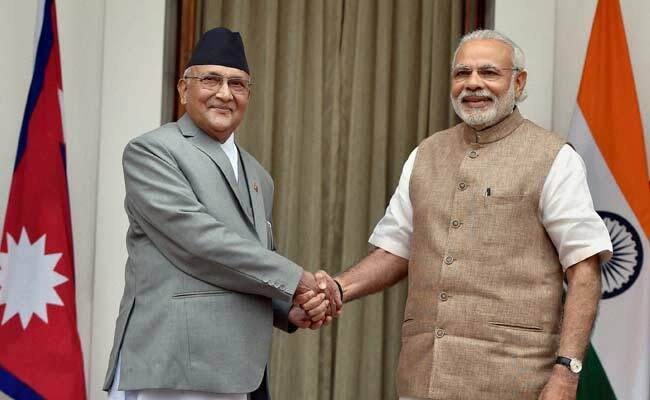 PM Modi has repeatedly underscored the India-Nepal ties. Underscoring that Nepal-India relations are "as old as the Himalayas and the Ganga", he said Nepal comes "first" in New Delhi's "neighbourhood first policy". After Beijing said it would extend its railway network up to Kathmandu, New Delhi has proposed the construction of new railway links connecting the two countries. One of the projects PM Modi and Mr Oli would look at inaugurating, if the visit happens, will be the renovated railway line between Nepal's Janakpur and Bihar's Jaynagar. In August, the Indian Railways conducted a trial run on the 8.5-km line from Jaynagar to Khajuri in Nepal. Some of Nepal's long-standing requests for India -- such as to access India's ports, easing up terms for exporting electricity to India, would also need immediate redressal. After complaints of Indian financial assistance spreading thin in Nepal, the two countries had decided to put a great deal of focus on three pacts signed during Mr Oli's visit to India earlier this year: partnership in agriculture, plans for connectivity through inland waterways and expanding linkages to connect Indian railway lines to Kathmandu. Nothing much has happened on Mr Oli's demand for greater Indian investment. "Indian investors have invested across the globe, so why not to go to the next door Nepal?" Mr Oli has questioned time and again. A visit by PM Modi is expected to provide an opportunity to address some of these concerns.